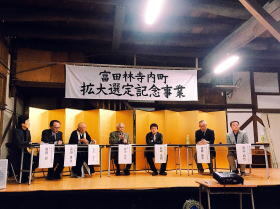 The commemoration symposium for the selection of the extended area of Jinaimachi historic district and the 21st anniversary of the selection of Jinaimachi historic district as a national preserved heritage site since 1997. 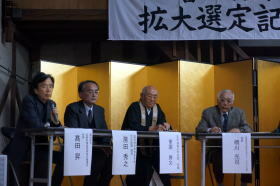 The commemorative ceremonies and symposiums were held for celebrating the selection of extended area of Tondabayashi Jinaimachi historic district, a national preservation heritage site at the venue of the ex. brewery factory and warehouse of Banri-no-Haru brand sake liquor which belongs to the Ishida family residence in the afternoon on November 23, 2018. 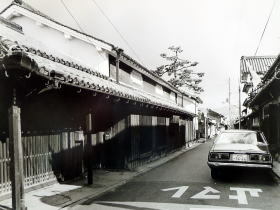 Tondabayashi Jinaimachi historic district is characterized by a traditional townscape where many old merchants' houses in the Edo period remain as they used to be and has been designanate as one of the national preservation heritage sites of traditional buildings since 1997. 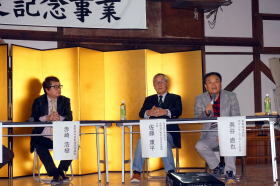 I participated as one of the panelists representing the Tondabayashi Jinaimachi volunteer guide association. 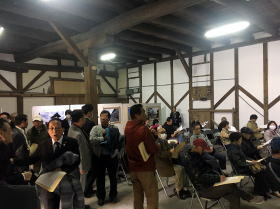 On Jinaimachi volunteer guide activities, I talked about its achievements and management tasks, and I also expressed my opinion about the future direction of community development in Tondabayashi Jinaimachi historic district. I posted the full text to be released as a panelist. On the day, I talked only about the outline of the full text as mentioned in the "Essay Vol.22" due to time constraints. 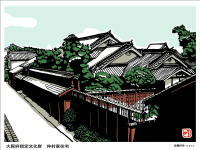 Congratulations on the commemoration project for the selection of the extended area of Jinaimachi historic district and the 21st anniversary of the selection of Jinaimachi historic district as a national preserved heritage site since 1997. I express my respect for the efforts of the residents, administrators and all stakeholders involved in the area for a long time. 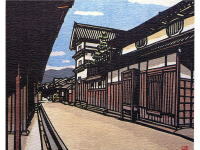 Born and raised in the Jinaimachi historic district, I lived in my parents’ house until graduating from a high school. I work as a company employee in Tokyo, and I live in Yokohama. 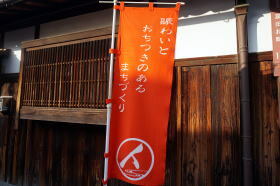 Since 2002, I have launched my personal website to introduce the local information of Tondabayashiji Jinaimachi. Since 2011, I have joined the local volunteer guide members and participated in community activities. Thank you very much for inviting me to the commemorative event as a panelist today. 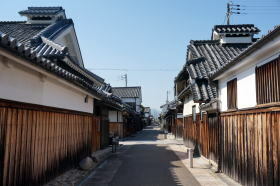 As for the current situation of Tondabayashi Jinaimachi historic district, elderly people and old people living alone have been increasing, and it is already becoming a so-called "genkai shuraku” or a marginal settlement. I recognize that the local communities are in danger of collapse such as an increase in vacant houses. It is the serious challenge that every local community in Japan has faced today. 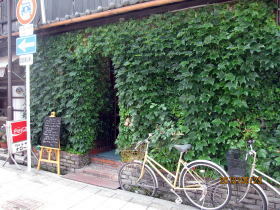 According to a shop master along the Tomiyama-cho street in the Jinaimachi historic district, the residents are almost over 60 years old. 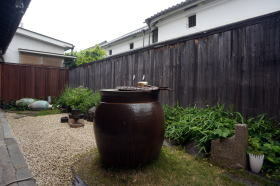 It is also like a survival competition game between the local communities, and it may happen that any selected area of national preserved heritage sites in Japan cannot maintain the townscapes as they are today in near future due to the serious problem of sustainability on each local community. 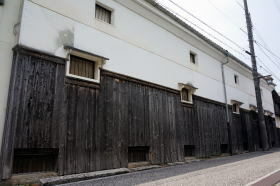 In such difficulties, the valuable historic heritage site of Tondabayashi Jinaimachi which has lasted over 460 years since the Sengoku period must be handed over to the next generation like the preservation of steam locomotives in a moving state. 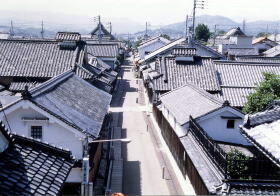 The challenges of the community in Tondabayashi Jinaimachi are folded in a double structure of sustainability of community and historical inheritance. 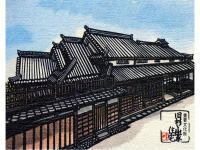 "Town development with calm and bustle"
I recognize that the master concept has been created as a basic philosophy by the wisdom of the predecessors. We have been proclaiming town development that harmonizes with moderation without pursuing excessive commercialization. 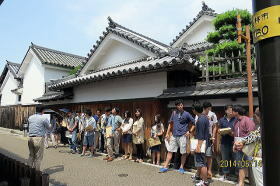 Even at the time of volunteer guided tour, I always inform visitors of this concept of town planning and development. 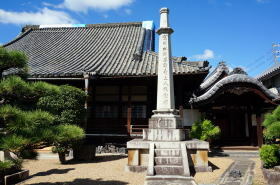 In the society in the 21st century where further improvement of the digital economy makes progress, Tondabayashi Jinaimachi historic district where relaxed time flows has extremely high value of a healing space and time for the modern people. It is necessary for the community to recognize this value again. I understand the basic philosophy of "town development with calm and bustle" as follows. ① Harmony of securing quiet living environment and revitalizing regional economy. According to the access log analysis of the web site, the information of the shop is always at the top in the number of browsing. Listening to the impressions of visitors, there are few eating places and there is no place to spend time at ease. I believe that more visitors will come back considerably if these fundamental issues are to be solved. To improve the still low recognition in the nationwide is also a challenge. Most visitors come from Osaka prefecture. Strengthening horizontal cooperation with concerned organizations each other, including regional tourism promotion board and principals of each event organizations. In addition, it is necessary to positively transmit regional information to the world. 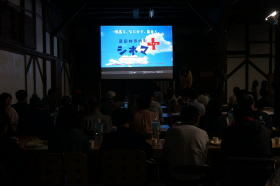 A movie-focused event was held at the venue everywhere in Jinaimachi historic district last week and Jinaimachi has been recently selected as a film location for Chinese film. Such steady efforts will lead to an increase in visitors. It is also a good idea to ask visitors to undertake regional ambassadors. In order to solve regional issues, it is necessary to create a "new mechanism" for dual sustainability of community and historical inheritance. I believe that it is difficult to maintain local communities and historical heritages unless we can build a mechanism that money is recirculated in the local community. It is also important to procure funds outside and develop business. If none lives in the “Genkai Shuraku” or a marginal settlement, it is also a time to transform ideas focused on future-oriented towns, that is to become a technology experiment site, a test bench. Perhaps it seems like an unexpected idea, but how about trying to become a "funny town"? While developing the Japanese-style hospitality by robots, it is making a new town that coexists with robots. Trying to revive local Japanese sake by a brewing robot. Trying to run a local inn to reuse an old private residence with a service robot. Trying to take care of the elderly by nursing robot. Trying to clean up the road by a cleaning robot. Trying to open unattended stores and operating a cashless settlement special zone. Since the shortage of labors has been extremely serious, why do not you try to orient a near-future society that creates an ecosystem that reduces marginal costs from labor-intensive to zero? 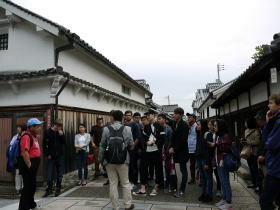 The guided tour for foreign visitors was held in October, 2017. 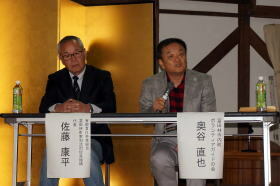 The movie event was held at the venue of ex. 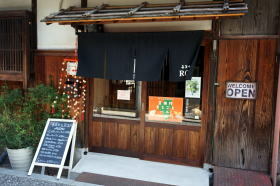 brewery of Banri-no-Haru brand sake liquor on November, 2017. I am from the family of traditional property owners. We cannot demolish the traditional tangible property in the national preserved heritage site while the property is privately owned. 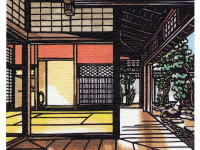 We are required to preserve the original shape and outlook of the structure. Furthermore, we cannot bear the personal burden in repair and renovation costs of houses and maintenance expenses of empty houses. Damages repairs by natural disasters such as large typhoons caused by global warming are quite frequent, and restoration costs are also increasing. The private management of old traditional property as preserved cultural assets is becoming more and more difficult, and we must consider new system like joint trust management by third party institutions, for example. I believe that it is important not to hesitate to respond to change while judging what is not changed and what will change in the changing times. Thank you for your attention. 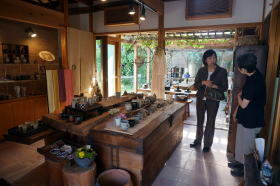 Manager of the personal website – Visiting Tondabayashi Jinaimachi, a historic district and heritage site.